In an earlier feature article on this blog, I introduced our young ButterflyCircle member, Jonathan Soong. This talented young Singaporean never ceases to amaze with his gift of painting spectacularly life-like renditions of nature subjects. Jonathan spent some of his free time this year to paint this 11" x 14" oil-on-canvas rendition of the Commander as a special Christmas gift for me. 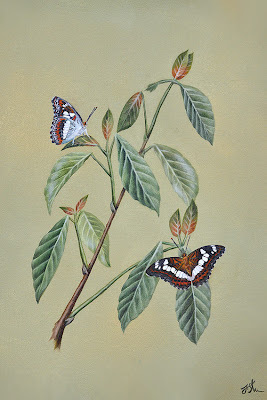 As can be seen, his masterful brush strokes bring both the butterfly and it caterpillar host plant, Timonius wallichiana, to life! The details of the leaves and the butterfly (both upper and underside) are true to life and the colours accurate. Close ups of the butterflies in the painting shown above feature the exquisite details in Jonathan's handiwork. Many thanks, Jonathan! I will certainly cherish your work of art that is made more meaningful because it is my avatar in cyberspace - the Commander. Merry Christmas and a Happy and Successful New Year to you and your family!